A study published by the faculty of Medical University of South Carolina indicates that oil spills and the chemicals used to clean up those spills may be contributing to the obesity epidemic. About six years ago, in April 2010 an explosion in Deepwater Horizon caused the release of over 200 million gallons of crude oil into the Gulf of Mexico. In response, about 2 million gallons of dispersant was used to emulsify the released oil with the hope of hastening oil biodegradation and preventing the spilled oil from reaching fragile habitats onshore. potential endocrine and metabolic disruptors. Endocrine-disrupting chemicals (EDCs) can cause developmental and reproductive abnormalities by disrupting hormonal balance. Epidemiological studies link human exposure to EDCs with obesity, metabolic syndrome and type 2 diabetes. Obesity is a major global health problem that contributes to a variety of diseases, including hypertension and cancer in addition to type 2 diabetes. Historically obesity in individuals was attributed to an imbalance in food eaten versus energy expended. Poor nutrition, lack of exercise and other lifestyle were considered the drivers of the obesity epidemic. Recent evidence now suggests that certain environmental agents known as “obesogens” may also significantly contribute to obesity, especially in children. Studies using cell cultures and animal models indicate obesogenic compounds appear to alter metabolism and fat cell production. The study should serve as warning. In addition to being used as a dispersant in oil spills, the chemical is also used in many consumer goods, including household cleaning products, deodorants, hair coloring, nail polishes and as a laxative for pregnant women. That’s right. The study suggests that a laxative given to pregnant women may alter the endocrine and metabolic systems of both the mother and her child. Historic studies of chemicals used in our daily lives, if conducted at all, typically focused on what exposure levels caused cancer. New scientific understanding requires study into the impact of everyday chemicals in altering other human systems, including endocrine and metabolic. Obesity related diseases are difficult for individuals and their families. The increased rates of obesity is creating major pressure on the US health care system. Understanding the role of chemicals in the growing obesity epidemic will save lives, reduce healthcare costs and improve public health. Allocating research funds to understand the role of obesogens on human health is an imperative. Suppose the NCAA ruled that North Carolina, who are favored to win the national title this year at 6/1 odds, were no longer required to comply with the three seconds in the lane rule? What if every other team was required to adhere to the three seconds rule but the NCAA decided that only the Tar Heels need not comply? That’s the situation the United States is currently facing in the debate about shale oil and gas extraction using hydraulic fracturing (popularly called fracking). Up until 2005 the oil and gas industry, like other industries in the United States, was required to comply with the federal environmental laws that governed safe drinking water, storm water runoff, hazardous waste disposal and “right to know” laws that dictated disclosure of chemicals to emergency responders amongst others. In 2005, Congress passed and George W. Bush signed into law what has become known as the Halliburton loophole as part of the Energy Policy Act. The Halliburton loopholp further exempted oil and gas companies engaged in high volume hydraulic fracturing (HVHF) from complying with certain environmental laws that had been on the books for decades— the same health and safety laws that other American industry must still comply. Among these laws was the Safe Drinking Water Act of 1974. That’s right. For about thirty years the oil and gas industry was treated like any other American industry. Everybody had to adhere to the rules that kept American drinking water safe. Including energy companies that used HVHF as part of their drilling operations. And the oil and gas industry prospered during those 30 years even under heavy federal environmental regulation that promised to protect drinking water. New technologies were developed that reduced the numbers of dry wells drilled to almost zero. Old technologies like HVHF were applied in new ways that allowed the industry to open up huge new fields with abundant potential. From 1974 to 2005, energy companies showed consistent profits and energy stock was viewed as a must have in balancing stock portfolios. It is only AFTER environmental rules for oil and gas were relaxed with enactment of the 2005 Halliburton loophole that the spot price of oil and gas went into free fall. The root of the word “regulations” is “regular.” The purpose of regulations is to establish regular, predictable rules by which everybody is governed. That includes environmental regulations, which are designed to keep our parks open, our air breathable and our water drinkable. The energy industry insists that HVHF is safe and important to our economy. So why shouldn’t the industry play by the same rules other industries comply? The Halliburton loophole should be closed for the same reason the NCAA should not be giving an exemption to the Tar Heels from the three seconds rule. Democracy and fairness dictate that everybody comply with the same rules (whether in basketball or business) so the playing field is level and the players and spectators are all safe. Closing the Halliburton loophole is good for the environment, good for public health and good for business. Requiring oil and gas companies to comply with environmental health and safety rules ensures that only viable actors participate, keeps prices of oil and natural gas stable and reduces competition from bad actors who foist the cost of environmental degradation onto the public. When GreenHunter Water LLC proposed shipping fracking wastes by barge, a lot of folks objected. The United States Coast Guard (USCG) decision last week to evaluate permits to barge fracking wastes case-by-case has not quelled public concern. High volume hydraulic fracturing uses million and millions of gallons of water per well to extract natural gas from shale. During shale gas extraction, the water used is exposed to process chemicals plus metals and radon from the earth. GreenHunter is in the business of working with oil and gas drillers to dispose of fracking waste. Even before the chemical spill in the Elk River, many were concerned about the impact of accidents and spills on drinking water if barging of fracking waste on the Ohio River was allowed. Over 70,000 voiced concern by submitting letters to the dockets opened by the Army Corps of Engineers (COE) and the USCG respectively. GreenHunter was transporting oil and gas wastes using its over 400 truck fleet and the company needed permission from USCG and COE in order to shift transport from trucks to barges. In 2011, GreenHunter sought permission from the USCG to transport Appalachian fracking wastes by barge over the Ohio River. In 2013, GreenHunter made a parallel application to the COE to build a barge offloading facility on the Ohio River. USCG expected the GreenHunter request to be the first of many to barge fracking wastes. Hence, USCG proposed a policy change in 2013 designed to standardize both the process for barge owners seeking to transport wastes from shale gas extraction as well as the information submitted to USCG. The proposed USCG policy would have included the GreenHunter application and would allow expediting future applications. Public response to the proposals before both COE and USCG was robust and overwhelmingly negative. 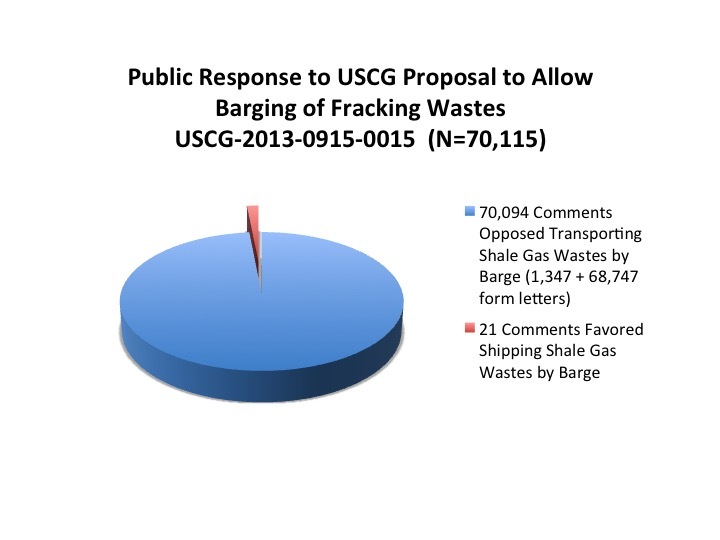 70,094 comment letters were sent to USCG opposing transport of fracking wastes by barge; only 21 supported the USCG proposal to allow shipping of fracking wastes by barge. Of the 460 comments COE received, 447 asked COE not to grant the permit to build a barging facility. In 2014, GreenHunter modified its application to COE seeking permission to build the the barge offloading facility and promised to transport only wastes from traditional vertical oil wells. The revised permit would not allow transport of wastes from shale gas extraction. As such, in 2015, COE granted the modified GreenHunter permit to build the facility. On February 23, 2016, one year after COE permit was issued, USCG withdrew its proposal. Rather than issue a blanket policy, USCG said it would evaluate requests to barge fracking waste on a case-by-case basis under the existing decades old USCG regulations. USCG punted on the need for a policy change. USCG said it would consider instituting a standardized process for transporting fracking wastes in bulk after USCG assessed “whether current regulations are inadequate to handle requests for transport …and environmental impacts that may be associated” with transport by barge. USCG further stated that the agency would use acquired experience with individual approvals to inform future rulemaking or guidance. The USCG policy withdrawal has raised many questions: Is USCG approval of barging fracking wastes by GreenHunter imminent? If so, will COE modify its permit to allow the new GreenHunter Ohio River barge facility to include wastes from shale gas extraction? While the future of barging fracking wastes is far from clear, certain lessons from the administrative process are crystal. The COE and the USCG dockets both indicate that the public has concerns about barging wastes from shale gas extraction. Public concerns about mechanisms to protect drinking water must be considered by USCG before issuing any permit to barge fracking wastes. Spills and accidents are a predictable problem. Addressing public concern about safeguarding water should not be ignored. On Wednesday, California Governor Jerry Brown declared a stage of emergency in the affluent Porter Ranch neighborhood in Los Angeles due to a gas leak spewing about 12 tons of methane per day. The leak began in October. The LA gas leak provides another cautionary tale for those who want the United States to convert our coal fired power plant fleet to natural gas under the Clean Power Plan. While natural gas burns cleaner than coal, methane is a more potent greenhouse gas than carbon. Natural gas pipe infrastructure in this country is old. A lot of the pipes, production facilities and infrastructure needed to supply natural gas to homes and businesses already have slow leaks. One study estimated methane emissions in Manhattan at 8.6 billion cubic feet per year. Leak detection technology shows the methane leaks in Manhattan track the pipes running under the city. The enormous leak in Los Angeles is not the first dramatic sign of trouble with natural gas infrastructure in the United States. In New York, gas explosions in East Harlem and the Borough Park section of Brooklyn caused 10 deaths and total destruction of two buildings. Evidence of perils from climate change clearly dictate we need to take action to curb greenhouse gases. The dramatic drought, floods and fires suffered throughout the country this holiday season give ample examples of how climate change causes human suffering. Reducing carbon emissions from power plants is an important step in slowing climate change. Replacing carbon emissions with methane emissions is not, however, a step forward. The Clean Power Plan calls on states to submit a plan for conversion away from coal fired power plants. States have flexibility in how to replace coal when designing their respective plans. If the state does not propose a plan, then the plan set by US EPA (the so called Federal Plan) will apply. EPA drafted a proposed Federal Plan that is open for public comment until Jan. 21. State plans need to be carefully and thoughtfully drafted. Replacing coal with natural gas means the country will increase fracking. It is imperative that states submit plans to comply with the Clean Power Plan that use energy consumer conservation efforts and incentives to expand solar power on buildings as a means to reduce carbon. By law, EPA is not allowed to include consumer conservation efforts and incentives to expand solar power as a means to reduce carbon emissions. So states that do not submit a plan and rely on the Federal Plan will not be able to use consumer conservation efforts and incentives to expand solar power in buildings as part of their carbon emissions reduction plan. States relying on the Federal Plan are likely to use conversion to natural gas as means to reduce carbon emissions – which again means increased need to frack for natural gas. More use of natural gas without efforts to upgrade infrastructure will result in more tragic leaks and explosions. As the country moves to reduce our carbon footprint, we need to create incentives to use renewable energy sources, upgrade existing natural gas infrastructure so gas used is safe and avoid increased reliance on fracking. Our study examined the impact of EO 13211 on United States environmental and conservation regulations proposed and promulgated by federal agencies. In the study, we found that during rule making proceedings, EO 13211 had almost no effect on environmental and conservation actions taken by federal agencies. Most federal agency rules, both proposed and final, evaluating energy impacts pursuant to EO 13211 found no “significant energy action” and accordingly did not necessitate further regulatory review. In most cases, energy evaluation was routine, did not alter environmental or health policy and was reflected in brief, boilerplate language. The proposed expansion of oil drilling in Big Cypress could have been prevented. Today, environmentalists bemoan the failure to purchase mineral rights in Big Cypress as a terrible mistake. Big Cypress National Preserve was created in 1974 to “ensure the preservation, conservation, and protection of the natural scenic, floral and faunal, and recreational values of the Big Cypress Watershed.” As a swamp, Big Cypress is critical to the watershed of the Everglades. Wetlands purify freshwater and absorb storm surge to prevent floods. The ecology of Big Cypress is not, however, pristine. Oil production began in Big Cypress in the 1940s. The preserve is home to numerous threatened or endangered species (including about 30 to 35 Florida panthers) considered “indicator species” — indicating the ecosystem, here Big Cypress, is sick. Burnett Oil Company filed an application with the National Park Service to conduct a seismic survey of 110 square miles (70,454 acres) in the preserve. The study will evaluate the feasibility of drilling more oil wells. The National Park Service just completed an Environmental Impact Study evaluating the Burnett plan. Burnett Oil Company owns the mineral rights on more than half the 730,000 acres that make up Big Cypress. When Big Cypress was created, the swampland was transferred to the federal government but the the mineral rights lying below the park were retained by the Collier family, who leased their right to drill for oil and gas to Burnett. Since efforts by the Bush administration to buyout the mineral rights on about 500,000 acres in Big Cypress for $120 million dollars were firmly rebuked in 2005, mineral rights in Big Cypress continue to be privately held. Public debate over further drilling in Big Cypress is contentious. Homeowners worry drilling may occur close to their homes. Environmental groups are concerned that the seismic study may lead to drilling that could contaminate the aquifer that most of Florida relies on for its drinking water. The Natural Resources Defense Council, National Parks Conservation Association and Conservancy of Southwest Florida expressed concern that even studies exploring the possibility of increased oil drilling in Big Cypress will exacerbate ecological distress since the oil exploration will require use of large trucks and heavy machinery over a 110 square mile swath of pristine wetlands. The controversy over increased oil drilling in Big Cypress is intensified by the fear that Burnett might use “acid fracking” (a process of pumping acid to stimulate well production). Although state and federal government may limit the scope of oil drilling activities by permit to protect public health and the environment, the US Constitution protects mineral owners from taking without compensation. Hence, the only way to completely prevent further oil and gas development (with or without acid fracking) in Big Cypress is for the government to purchase the mineral rights. Which takes me back to my opening statement. In hindsight, the Collier sale of oil rights hardly looks like a “taxpayer ripoff.” In hindsight, the Bush plan to purchase Florida mineral rights looks like genius.